From battles and beheadings, to plots and plague, this book tells the story of life in Britain under the Tudors and Stuarts. Author/Editor: Fiona Patchett et al. An excellent overview of the period... the narrative style makes the book easy and interesting to read and the layout and design are exceptional. This book is really brilliant. 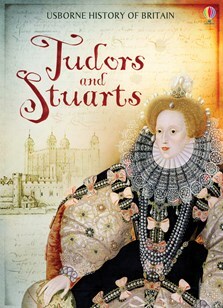 It would be really helpful if you are doing a project on the Tudors or Stuarts because it includes lots of information. This book might not be suitable for children under 7 years old. This book helped me when I was learning about the Tudors and I was the only person who knew about the tudors the most. It also helped me when we did a letter as Anne Boleyn. Thanks Usborne for being a historical pal!!!! !.